Sweden released a handbook of its "feminist foreign policy" Thursday for rights groups and foreign governments, showcasing lessons from the Scandinavian nation's flagship approach to promoting women's rights globally. The manual, published on the government's website in English, is derived from four years of work to place gender equality at the heart of the country's international agenda. Sweden began its feminist foreign policy "in response to the discrimination and systematic subordination that still mark the daily lives of countless women and girls around the world", the handbook said. "One starting point is that gender equality is an objective in itself, but it is also essential for achieving the Government's other overall objectives, such as peace, security and sustainable development," it added. 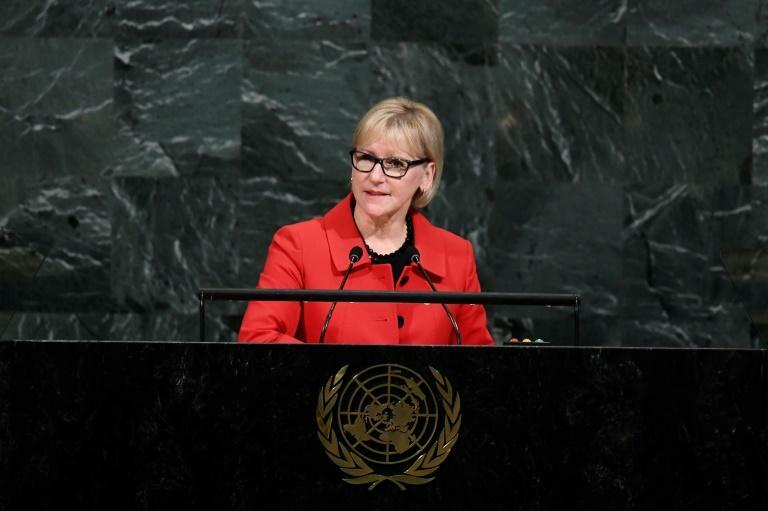 Led since its inception in 2014 by Foreign Minister Margot Wallstrom, its goals include the promotion of economic emancipation, fighting sexual violence and improving women's political participation. "We were met with mixed reactions including a bunch of giggling in the first days and outspoken resistance," Wallstrom told told a news conference in Stockholm. "We've constantly heard 'these are just pretty words', so this is why (the handbook) is important." Projects cited in the manual include an action plan for five war-torn and post-conflict nations -- Afghanistan, Colombia, Democratic Republic of Congo, Liberia and the Palestinian Territories -- building in targets for women's rights and empowerment for the first time. The handbook highlighted Sweden's work in Congo to promote "positive masculinity" in the country, where it is has run initiatives such as promoting social media debate on men's role in society. "There are so many countries with so much more to do," Wallstrom said, though she insisted that while the policy is in its early days, it has shown signs of success. She said the name of the guidebook had been "a bit provocative". "In some countries, using the term feminist has a negative connotation, but I think we've been able to demonstrate that this is what it means -- that women and men should enjoy the same rights and the same duties and the same opportunities in society," she told AFP. Wallstrom, who last year joined the #MeToo campaign and said she had experienced sexual harassment "at the highest level of politics," has been an outspoken critic of nations' gender policies. In 2015, Stockholm's diplomatic ties with Riyadh were frozen after she called Saudi Arabia a "dictatorship", denouncing in particular its treatment of women in brazen terms that other Western diplomats might have avoided in dealing with the oil-rich state. The growing influence of women in Sweden's own foreign service is encapsulated by a graphic showing the rapid increase in women in the post of ambassador for the country, from just 10 percent in 1996 to 40 percent in 2016.